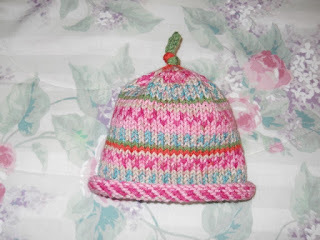 Cap in photo is knit with Hobby Lobby's I Love That Yarn, Prints, Gelato Stripes. Rounds 1-8: K2, P2 around. Knit every round until cap measures 5 inches from cast on edge. Start I Cord: K2tog, k2, k2tog for the first row only. Knit 3 or 4 inch I Cord with the remaining 4 stitches. With 16 inch needle, cast on 54 sts. Join and work in the round.